By jrosenhouse on September 5, 2016. I realize that I never finished the story of how I achieved the exalted rank of expert at chess. Suffice it to say that I played two more games beyond the ones I have already reported on. Both were against 1900 rated players and both were rather dissatisfying draws. 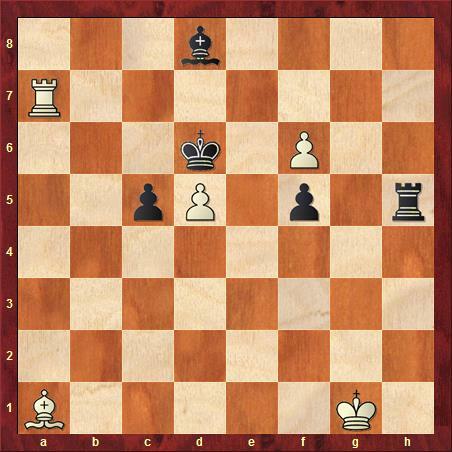 In the first I had the black side of a Queen's Gambit Declined, got the worst of it out of the opening, but then found a nice maneuver to get out of trouble when my opponent dithered a bit in the middlegame. In the second I had the white side of a Sicilian Kan, which quickly ended up in a standard Hedgehog formation. We shuffled the pieces aimlessly for a while before agreeing to a draw. That's the Hedgehog for you! I thought I was worse in the final position and was happy to get a draw. The computer said I was much better and suggested a bunch of lines I hadn't even looked at. Cower before my expert-level positional judgment! Officially there were two rounds to go, and I really liked playing on those wooden chess sets. But I was also getting very tired and it seemed to me my play was deteriorating. My informal calculation said I was up seven rating points (I only needed four!) So I decided to withdraw from the tournament and simply declare mission accomplished. Spare me the lectures about fighting spirit. I've been playing this miserable, time-sink of a game for thirty years and dammit, just this once, I wanted my friggin rating points. So sue me. Anyway, let's have a look at some real chess. Rio is already a distant memory. The real Olympics are going on right now in Baku, in Azerbaijan. I'm referring to the chess olympiad, of course. The United States has its strongest team ever, with Fabiano Caruana, Hikaru Nakamura, and Wesley So on the first three boards. All are among the world's top ten players. We're giving up some rating points on board four, but Sam Shankland and Ray Robson are not exactly pushovers. The US team got nicked for a draw in round four against a strong team from the Czech Republic. But top seed Russia lost to Ukraine, in part because Alexander Grischuk collapsed against Alexander Volokitin on Board Four. A bad day for the Russians, but we're talking about mighty strong teams that have the likes of Grischuk and Volokitin on Board Four. Anyway, here's an interesting position from the round two matchup between India and Costa Rica. India is a major powerhouse, even without Anand playing for them, and are a dark horse to finish on the podium. Costa Rica is less strong. 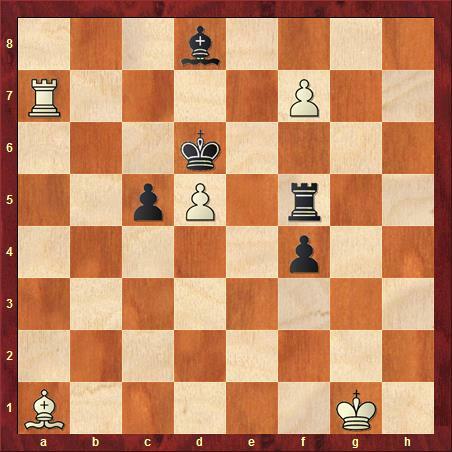 The position below comes from the Board One game between Bhaskaran Adhiban, playing white, for India and Sergio Minero Pinedo, playing black, for Costa Rica. Adhiban is already a top grandmaster and is still improving. Pinedo is rated a whisker below 2400. No slouch, but a draw with black against Adhiban would have been a real accomplishment. Black to play. The draw was at hand by sacrificing the bishop for the pawn on f6, and then taking the pawn on d5 with the king. After that, the best white could get would be king, rook, bishop against king and rook. That's a well-known draw, and a fairly straightforward one if the defender knows a few standard techniques. Looks good! Seems like the white pawns are under control and the peace treaty is imminent. But not so fast. The position is actually white to play and win. Incredible! If black takes with the bishop then his rook is obstructed and white just promotes his pawn. If black takes with the rook (which is what he played in the game), then white plays Ra6+ skewering the king to the rook. After the king moves out of the check, white just takes the rook. Game over! Black resigned. Great stuff! I caught some of the live broadcast this morning between classes, and it was excellent. But if you cannot tune in for that I recommend the recap videos by British grandmaster Daniel King on YouTube. That's where I found this little nugget. The videos are ten to twenty minutes long and King's commentary is very lucid. What a beauty! I'm gonna go check the game on YouTube, Thanks! Did you catch the Round 5 "Contemporary Romantic" games? The first two games in this link to the Daniel King youtube site are absolute doozies! I watched the video! Great stuff. It's comforting to see that chess like this still gets played.